Gomphidius glutinosus (Schaeff. : Fr.) Fr. 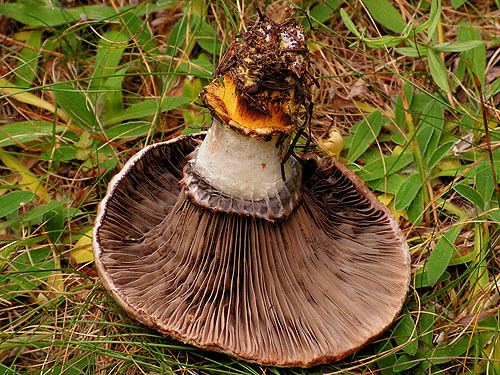 Fruitbodies with glutinous veil, its remnants seen as glutinous ring in the upper part of the stipe. Cap up to 10 cm, depressed, often umbonate, rarely flat, flat-convex or convex, grey to brown, viscid. 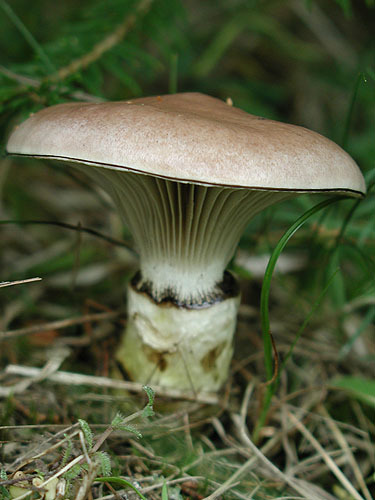 Stipe mostly cylindrical or sometimes spindle-shaped and usually tapering towards the base, white, whitish or sometimes brownish, yellow in the lower part, with glutinous ring in the upper part. 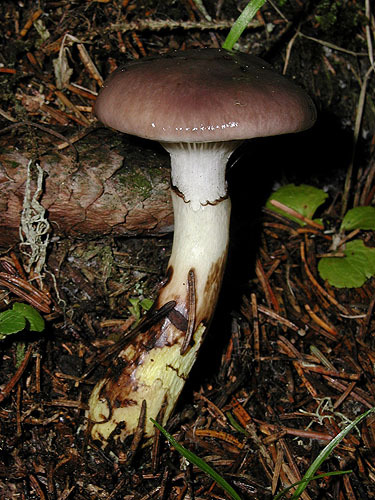 Flesh white or whitish, yellow in the stipe base, unchanging when exposed to air. 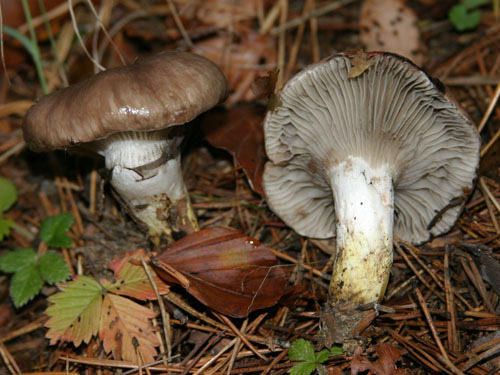 Gills whitish at first, gradually becoming grey to dark grey with age, unchanging when bruised. Smell not distinctive. Taste not distinctive. Spores 17–20 × 5–6.5 μm. Habitat. In coniferous and mixed forests, mycorrhizal with pines (Pinus), rarely with other conifers. Similarity. Might be confused with Gomphidius maculatus, but the latter has strongly blackening fruitbodies.